TSS (Tethered Satellite System) was a joint project of ASI (the Italian Space Agency) and NASA to deploy from the Space Shuttle a 20-kilometer space tether connected to an electrically-conductive 1.6-m-diameter satellite. 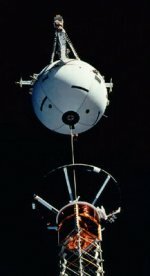 During the first test of the Tethered Satellite System (TSS-1), in 1992, a fault with the reel mechanism allowed only 256 m of the tether to be deployed, although the satellite was recovered. On the second mission, TSS-1R in 1996, 19.6 kilometers (12.3 miles) of tether was deployed before the tether suddenly broke and the satellite was lost. Science data was collected aboard the satellite, the Shuttle orbiter, and from a network of ground stations monitoring the Earth's ionosphere. Five hours of tethered operation yielded data on tether current and voltages, plasma particle and wave measurements, and visual observations for a variety of pre-planned science objectives. During the break event, large currents were observed to be flowing between the satellite and the Orbiter. Further scientific data were obtained from the instruments on the satellite after the break, when the science and NASA support teams were able to capture telemetry from the satellite during the overflight of NASA tracking stations. One important finding from TSS-1R has been the high level of current collected by the satellite at relatively low voltage throughout the deployed phase of the mission. Surprisingly large currents were also observed during the tether break and gas releases, indicating important new physics at play.